A hundred years ago this week… The Battle Of Passchendaele (July 31-November 10) began, its importance as an iconic passage of World War 1 accurately reflected by all the current remembrance events and programmes. Clearly, it was controversial from conception to conclusion with British PM Lloyd George and French Chief Of General Staff Foch among its opponents till late in the day and Field Marshall getting the go-ahead from the Cabinet only fours days in advance it seems. Prepared by 10 days of artillery bombardment expending 4.25 million shells, the attack by British, Anzac, New Zealand, Canadian and French infantry was initiated via the subsection of the grand plan known as the Battle Of Pilckem (July 31-August 2). The infantry advance, led by a “creeping barrage” south and east of Ypres started early in the morning and gained 2,500-4,000 yards along a 15-mile front, although near Ypres itself the German Army drove the British back – until halted in part by mud, already a torment to all even though the day’s downpour had only started during the afternoon. Hague reported to the Cabinet that British casualties for the three days were low compared to the first day of the Somme at 31,850 – German estimated at about 30,000. On the Eastern Front, the Russian decline continued. In what is now western Ukraine, then a region known as Bukovina, German and Austrian forces took Zaleszczycki and Sniatin (July 30; western Ukraine now), crossed the river Zbrucz on a 30-mile front (July 31) – resisting a later Russia counterattack (August 4), and reoccupied Czernowitz (3), and Vama (4). Meanwhile, down in German East Africa, the Allies pressed on with their effort to push the established colonial power out of this vast territory, driving them back from the River Lugungu (July 30) and setting out towards victory in the unusually extended Battle Of Rumbo (August 2-10; British/Portuguese deaths 386, German 1,500). Last week (100 years ago), Sam’s Battalion, on a route march which lasted several weeks, enjoyed the unanticipated luxury of a stint encamped at a “ducal estate” (I think my father got the wrong rank and it was an Earl’s pad, actually, but not sure). Musical evenings, even! ‘“Report to Company office!” This order, sudden and unexpected, increased the heartbeats and set me thinking about my recent behaviour… But I couldn’t come up with anything calling for reports or punishment. My unfavourite Captain** sat at a table in his tent, something between a smirk and a sneer on his unattractive face. Instead of the undeserved rebuke I expected, he rapidly read from a paper before him a statement that the Army required more officers than were coming forward, that promotion to commissioned rank should be offered to men considered suitable***. Whether the Captain intended it or not, cynical amusement at the very idea seemed to show in his face as he spoke. Perhaps I fell into an intended trap, but at that moment the thought of having to work with such as he appalled me; I took a snap decision. I refused the offer. And then I refused his suggestion that I take time to consider the matter. I seem to recall feeling some sort of satisfaction from being able to refuse to abandon my hoi polloi status. I see now that such feelings were childish, though gratifying at the time****. Next surprise, an announcement that every member of the Battalion would be medically examined the following day and re-graded. This must have shaken many a conviction that this lot were reserved for better things than warfare or, perhaps, that soldiering in the homeland was a necessary guarantee of the nation’s security. Everyone could think of a million reasons why “The Lost Division”***** should not have to board one of those wretched troopships and finish up among all the horrible bang-bangs. A cruel streak in those few of us who had already soldiered “over there” put smug grins on our faces when we observed the grim looks of some of the hitherto gallant defenders of the homeland. In fact, we had no justification for harbouring feelings of superiority. To imply that we were not willing to spend the remainder of our military service here, rather than there, would have made liars of us. I had no opinion for or against submitting to a medical examination and, thus, no interest in its taking place. I was, however, taken aback by an order to present myself at the medical marquee at 9am to act as clerk to the medical officer. I was scared, but asked no questions; obviously the 1914 lie about “Occupation: clerk” had caught up with me. Funny that — although now aware I had lied about my age******, it appeared they still accepted the occupational tag as correct. A moment’s thought by some administrator would surely have revealed that, at age 16, I could not possibly have been a full-blown clerk. *** I haven’t been able to find any information about what my father understood to be a new Army policy on commissioning the non-commissioned. Ring any bells, dear readers? **** “Childish” perhaps, but my father really did detest the idea of gaining rank. How far it was a matter of principle, how far a quirk of character, readers of the Memoir may decide. But his “previous” included requesting demotion from Lance Corporal to Private on the Somme (refused, and temporary promotion to Sergeant in the field ensued), and tearing off a Corporal’s stripe during his December, 1916, transition from the Kensingtons to the Essex Regiment – amid admin confusion this stuck, and he remained a Lance Corporal Signaller thereafter. 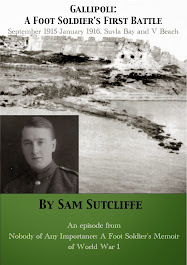 ***** As per last week’s reference… See Blog 131, January 8, 2017, for Sam’s strange account of the alleged/rumoured/maligned “Lost Division” – whose entry into the battlefield seemed to be forever deferred – to which his Essex Regiment Battalion, or at least stray, under-age members like himself, had been attached in Harrogate. ****** When he enlisted in September, 1914, he falsified his birth date by three years to make himself 19. ******* See Blogs 117, October 2, 2016, and 118, October 9, for that story. 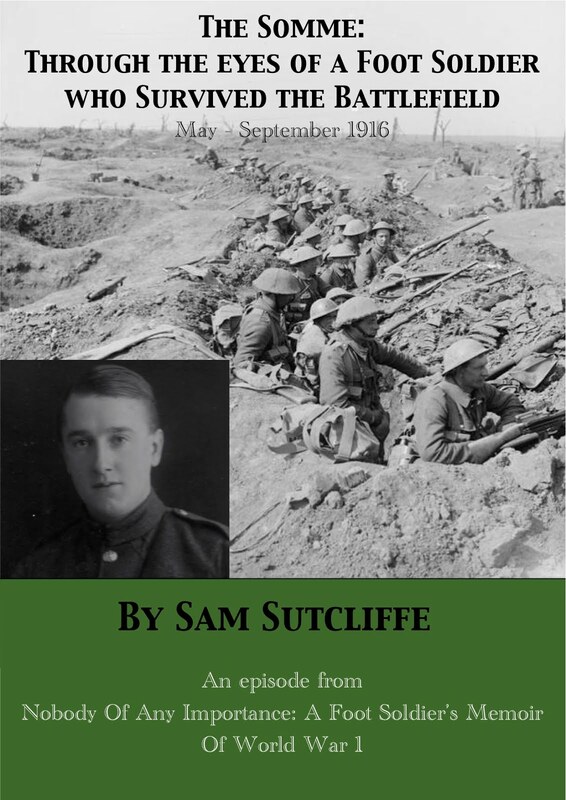 Next week: Sam does his clerkly duty at the Battalion medicals, recording near-Catch 22 verdicts of A1 – fit, so ready for return to the frontline slaughter – or C3 – unfit, so likely to survive safe at home. During the day, he learns a dodgy use for cordite… and eventually gets a good/bad diagnosis of his own condition. 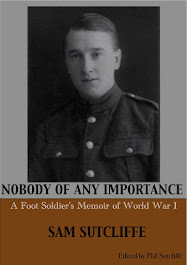 * In his 70s, Sam Sutcliffe wrote Nobody Of Any Importance, a Memoir of his life from childhood through Gallipoli, the Somme, Arras 1918 and eight months as a POW to the 1919 Peace parade. A hundred years ago this week… In the days before Passchendaele began, heavy artillery battles raged in Flanders (July 24 and 29), and the French had a successful time regaining lost ground north of the Aisne (24) and then repelling German counterattacks (25-7) and a further attack at Mont Haut, Champagne (26-7). In one of the war’s many necessary organisational steps to recognise new weaponry, the British Army founded the Tank Corps (28). But the most decisive action of the week saw the revived Romanian Army, supported by Russian Divisions, follow up an artillery bombardment along a 36-kilometre front at Marasti with an infantry onslaught which steadily drove the previously omnipotent German/Austro-Hungarian invaders back 20 kilometres, the most rapid rate of advance achieved in any 1917 battle (July 22-August 1; Romanian/Russian casualties 4,879, German/Austro-Hungarians 9,600). However, on the Eastern Front, the Battle Of Galicia (July 19-29) continued to run briskly against the Russian Army as Austrian and German forces retook Stanislau and Tarnopol (24; now in Ukraine), advanced in the Carpathians (25), crossed the Rover Sereth to take Kolomea (26), and reached the Russian frontier (28). Last week, my father recalled the start of the Battalion’s (probably) July route march and a terrible thunderstorm that broke over them when they camped outside Tadcaster – his young/old-hand experience ensuring his tentmates remained dry simply because he’d bought a ball of string and cunningly deployed it to raise the edges of the canvas a crucial couple of inches. ‘In fact, after my months of exposure to all sorts of weather, particularly in the Middle East, I quite enjoyed this soldiering in the homeland. I was aware that, during service on two Fronts, spells of over-exertion on poor diets had done me no good. My skinny body and limbs proved that. These months in England must build me up to better physical condition**, so that when the time came, as it would, when I must once more endure the front line, I should be the better able to cope. Some days of marching and nights of bivouacking terminated when we passed through the entrance to a huge ducal estate***. There, according to a careful plan, we erected the many Army bell tents which awaited us. Each day, supervised by trained officers, we had many jobs to do, all concerned with building a camp complete with efficient arrangements for cooking, feeding, ablutions, drainage and sanitation. Nothing must be wasted, we were told. We even installed filters to recover fat from waste water. It was required for explosives manufacture, along with all large bones – glycerine extracted became an important part of a compound which would cause havoc among our enemies (whereas I had thought of it as a sweet, sticky fluid which relieved sore throats). Whatever the nature of the work to be done, its purpose was explained. Eventually, we’d made the large camp as nearly perfect as possible. Then, the study and practice of warlike skills filled many of our waking hours – though our activities bore little resemblance to the training for trench warfare I had done at the base camp near Rouen when we arrived there from Egypt. In France, the officers and NCOs who operated the Battle Training Schools had all served at the Front, so they confined their methods to showing the troops how best to tackle the enemy, their slogan being “Kill! Kill! Kill!” But the so far home-based Division**** with whom I now served set great store by well-polished equipment and boots, correct drilling and marching, and similar harmless pastimes. They had, of course, heard that a great war had been raging for three years, but many of them must have hoped that it would not disturb the quiet, orderly existence secured for them by good luck and a little influence. One Company Captain had notices displayed summoning musicians to assemble in a marquee when the day’s work was done, bringing their instruments. Soon after that we had a musical Sunday afternoon, provided by a competent orchestra and several accomplished singers, al fresco, on an improvised stage. Our musical fame thus established, soon all ranks were invited to a Sunday afternoon concert held in the Duke’s riding school, a spacious and lofty building. Rows of chairs and forms occupied most of the floor space and faced a small stage. In front of this sat our orchestra, and to one side of them, almost facing us, the party from the Duke’s mansion, headed by the Duchess. I recall the pleasure I felt, sitting there in the front row and able to observe these people from a world apart from mine. The music was nice enough, most of the singing very good, and appreciative applause gave confidence to the hastily formed ensemble and their conductor. The elite clapped heartily and beamed their smiles on the performers and on us in the audience as well, not appearing stiff-necked and haughty as some of our cheap magazine stories had led us to believe they might be. ** However, “these months in England” already numbered eight since he left the Somme and an interim cushy number at the great British Army camp in Harfleur, near Le Havre – his physical problems were clearly more deep-seated than could be dealt with by three square (Army) meals a day, as will emerge in a forthcoming episode. *** You may be able to put me right on this, dear reader – I hope so – but I can’t find any “ducal” estates in Yorkshire. The main stately-home possibilities owned by lesser noble ranks at the time seem to be Harewood House (11 miles west of Tadcaster, their march’s first destination), seat of the Lascelles family and a succession of Earl Harewoods, and Castle Howard (26 miles northeast of Tadcaster), then seat of the Howard Earls and, more recently, impassive star of the Brideshead Revisited movie. My guess is the former, although I can find no positive evidence for it. But the latter is pretty much eliminated by www.yorkpress.co.uk’s noting that, in 1914, ‘When the Lord Lieutenant wanted to requisition Castle Howard for his Divisional HQ, she [the 9th Countess] went through the roof. “I don't want them swarming about the house and park,” Rosalind wrote. “Let them go to the Fevershams or the Middletons or to Hovingham”’– so WW1 was all very well, but definitely not in her backyard. 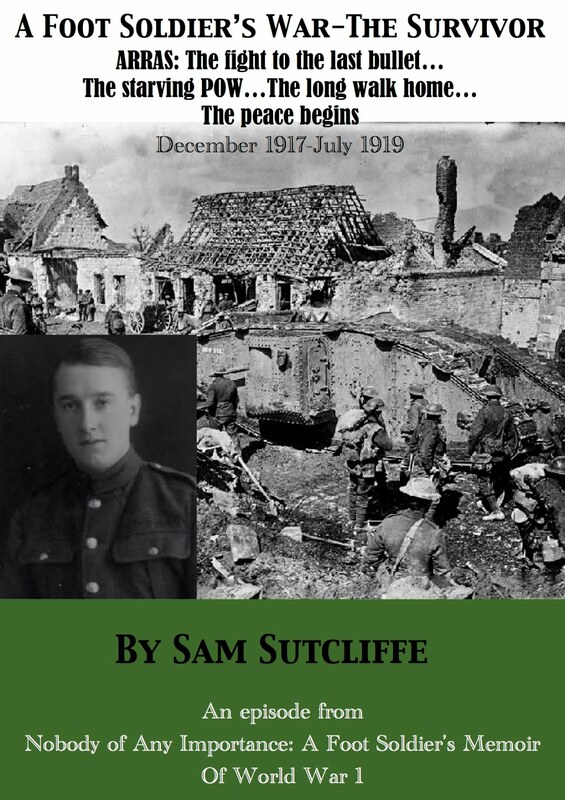 **** See Blog 131, January 8, 2017, for Sam’s strange account of the alleged/rumoured/maligned “Lost Division” – whose entry into the battlefield seemed to be forever deferred – to which his Essex Regiment Battalion, or at least some stray, under-age members, had been attached in Harrogate. ***** Ted, aged 21, remained somewhere on the Western Front.